The bells are housed in our historic bell tower. Until the beginning of the twentieth century there were six bells, the oldest dating from 1693, these were recast into a peal of eight in 1909. The present eight bells are housed in a frame built by Alfred Bowell in 1909. The majority of bell towers in the country have six bells, with only around 30% having eight bells. 1693 Tenor (of 6) cast by John Hodson. 1745 Treble and 5th (of 6) cast by Thomas Lester. 1758 3rd (of 6) cast by Lester & Pack. 1775 2nd (of 6) cast by Pack & Chapman. 1777 4th (of 6) cast by Pack & Chapman. 1909 Bells recast into a ring of 8 by Alfred Bowell. More information about our team of Bellringers here. 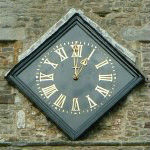 The clock is in daily use by many in the village. It is linked to the tenor bell in the tower and can be heard chiming through much of the village. 1. The Diocesan Archivist has dated it to around 1740. 2. It was built at Marden’s West End Forge. 3. It was built by a Tippen in the 19th century. 4. It was built by a Mr Snachell in the 19th century. It has for long been the Tippen family tradition that it is a Tippen clock. There were Typpens in Cranbrook around the time of the Armada. James Tippen, (born around 1801 in Maidstone), his grandson (also James) and great-grandson F.W., were clockmakers all (F.W. operating in Marden from around 1880 onwards). Although it has always been thought that either F.W. or his father built this clock, neither of them would be in line with the archivist’s date. Nevertheless the long family clockmaking tradition suggests that it could well have been built by a Tippen and around 1740. The name 'Snachell' is engraved on the back of the clock. A Mr Snachell was a contemporary of F.W. Tippen (he too thus being some 140 years later than the Archivist’s estimate: was there an earlier clockmaking Snachell?). or (2) if it is in fact a Snachell clock then F.W. Tippen (being a prominent villager and clockmaker) might have been regularly involved in its maintenance. 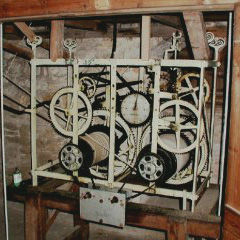 In recent years the clock has been restored by Hop Engineering of Staplehurst. It is wound by hand twice a week. When adjusting the time it can only be moved forwards, so whereas the start of summer time is an easy job, in October it has to be moved on through eleven hours (the striking mechanism is silenced whilst this is going on!). £1-10s (£1.50) "To 1 year's Salary for looking after the Church Clock". Settled Godfrey Emberson. Benjamin Dengate "for attending the Church Clock"
If anyone can shed better light on any of this, we should very much welcome it.